Rocking horse History. If you are interested in why rocking horses were so much a part of British culture & tradition, please enjoy the information on this page. English toys have always played a part in our history, reflecting the culture of the time. From medieval times when simplistic rocking horse forms were practised upon by aspiring knights, to the more advanced forms of the 18th & 19th centuries, that children practised balancing on, in their preparation for riding real horses. Rocking horses were to become a prominent feature in many children's nurseries, cruise ship liners & also retailers such as shoe shops & libraries. Manufacturers & also makers of baby carriages started to produce rocking horses in ever increasing numbers to meet the cultural demand of the time. The early Georgian & Victorian rocking horses were crafted from wood on bow rockers often made from elm. In 1880 the Marqua swing stand was patented by an American Phillip Marqua & this became a popular alternative for the traditional bow rocker, as the rocking horse could be ridden safely & the swing stand would remain in one place, rather than moving around the room as the bow rocker would, causing damage to walls, floors, furniture & children's toes! The old fashioned bow rocking horses could also easily tip over causing damage to the horse & young rider hence the safety stand became the preferred practical & safe choice for a rocking horse to be mounted upon. There were many manufacturers of rocking horses in the 19th & 20th centuries. Some of the more well known makers included F H Ayres, G & J Lines, Lines Brothers, J R Smith, Paul Leach, Baby carriages & Collinsons & Sons ( who are one of the oldest manufacturers to produce rocking horses over several generations). Several other lesser known makers also produced some really lovely rocking horses. Each manufacturer had their own style of carving & painting & dappling. Some horses show clues as to who they were manufactured by way of a stamp, label or indentation marks to the metal work, such as on the stirrup irons & brackets, but many horses were produced with no such markings & it is often through looking at the style of the carving, the type of turning on the swing stand posts & the decorations used on the saddlery and woodwork, that will give clues to the maker of the rocking horse in question. Some rocking horses made by different manufacturers can bear similarity due to workers moving between firms & taking with them the previous firms carving style. G J Lines & Woodrow rocking horses are one such example. 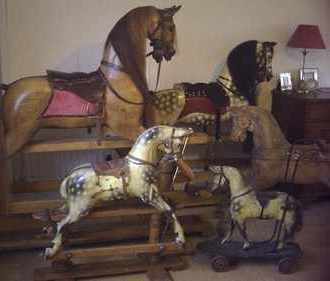 Many of these old rocking horses are now considered antiques to be invested in. Rocking horses in original condition with original untouched paintwork are the most sought after for investment antique value. In the 21st century there are many contemporary & traditional rocking horses makers, such as the Stevenson Brothers, Haddon rocking horses, Legends rocking horses ( Alec Kinane) & Harold Wakefield who has produced some absolutely exquisite carvings of rocking horse with unbelievable realistic detail. Sam Glass another very talented rocking horse maker also crafts stunning examples from traditional to bespoke. Jan Rusling who restores for Rocking Horse Elite is also a very talented carver & restorer. F H Ayres rocking horses are considered by some antique rocking horse collectors to be the most sought after of makes alongside G & J Lines. My advice when looking for a rocking horse to purchase, would be to go with a rocking horse that truly pulls at your heartstrings, regardless of make or provenance. There are many unattributed rocking horses with beautiful carving & presence that have a magic all of their own! There are further pages also that show the different types of rocking horses that were manufactured by the different companies. If you are trying to identify your own rocking horse the many photos on the identification pages links below, may be a help to you. This site is continually updated so do check back as new information is added.